For the first time ever, Westminster Abbey hosted its first fashion show. Gucci launched its Cruise 2017 collection at the historic London church, turning the hallowed halls into a runway. A-list stars graced the event, and front row regular Alexa Chung ensured all eyes were on her in a pink dress from the Italian luxury fashion brand. The 32-year-old fashion model rarely makes a fashion misstep, and her head-to-toe Gucci ensemble was no exception. She looked ladylike in a sheer pink midi dress that featured floral appliques, polka dot prints, a high collar and a frilly skirt with a waist-tie that accentuated her slim frame. 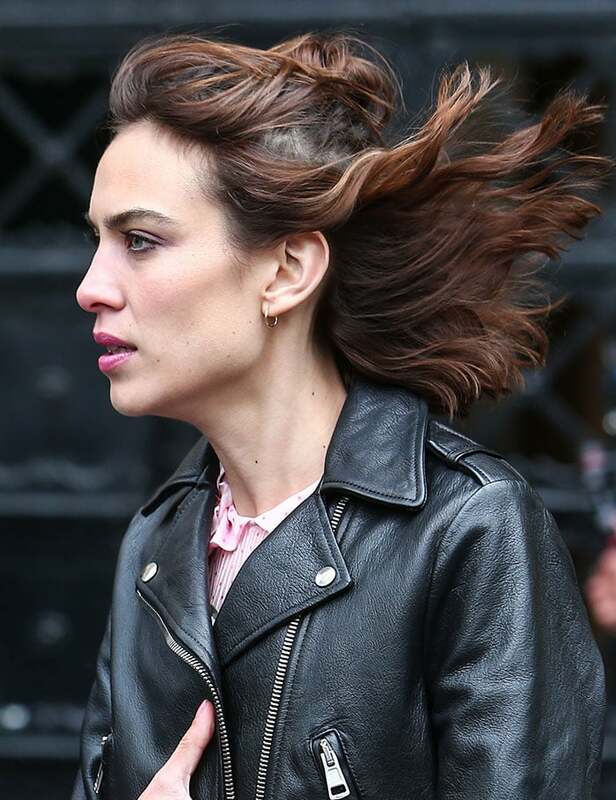 Outside the famed venue, Alexa threw a leather biker jacket over her girly, floaty frock, creating a perfect balance between feminine and tough. She kept her jewelry to a minimum, and played up the sweet-but-tough vibe of the look by slipping into a pair of black lace-up boots. Her short brunette tresses were simply worn down in loose waves and her makeup was pretty with a swipe of pink lipstick. Alexa teamed her ethereal Victorian-inspired dress with a pair of “Heloise” boots by Gucci. They are made of black leather and feature cutout details, back-zip fastenings, square toes, lace-up fastenings with mink pom pom ends and about 4.5-inch half moon-shaped heels in gold. You can check out these edgy-modern boots at Mytheresa.